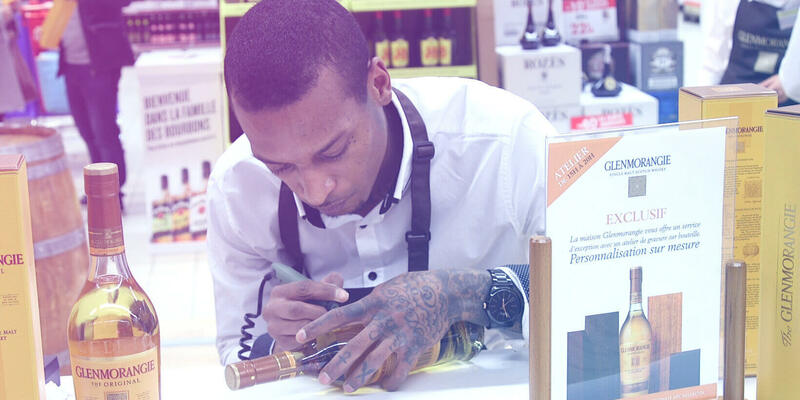 The Carrefour Podiums are proud to welcome Glenmorangie and its star product: The Original, aged 10 years. These premium spaces, designed by Globe, sport the colours of the Highland Single Malt Scotch Whisky brand to offer customers a physical and digital experience that combines tasting, immersion, and personalisation. 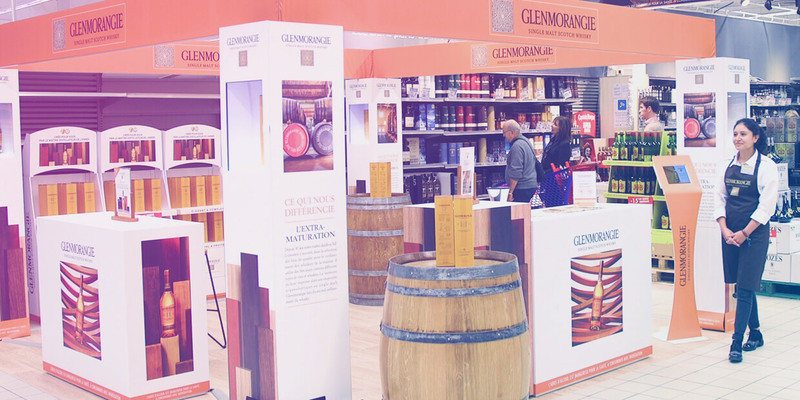 To give customers the chance to discover or rediscover the unique flavours of Glenmorangie’s emblematic whisky – “The Original, aged 10 years” – Globe designed a shopper and retail activation campaign in the form of an in-depth journey into the brand’s universe. With a dedicated tasting ceremony courtesy of Glenmorangie’s Expert, customers are initiated and guided in the art of whisky tasting through a multi-sensorial journey of smell and taste. 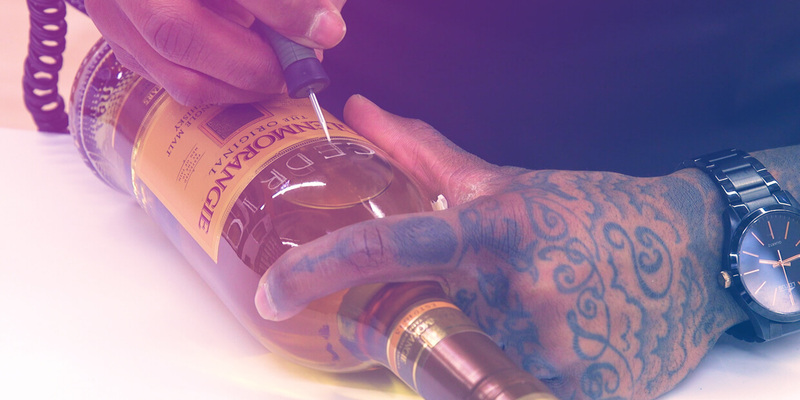 With My Personnal Glenmorangie, Globe offers a daily event in the form of a customisation workshop that gives shoppers a chance to have a bottle engraved with their names, a bespoke service that uplifts the status of the product and renders it entirely unique. 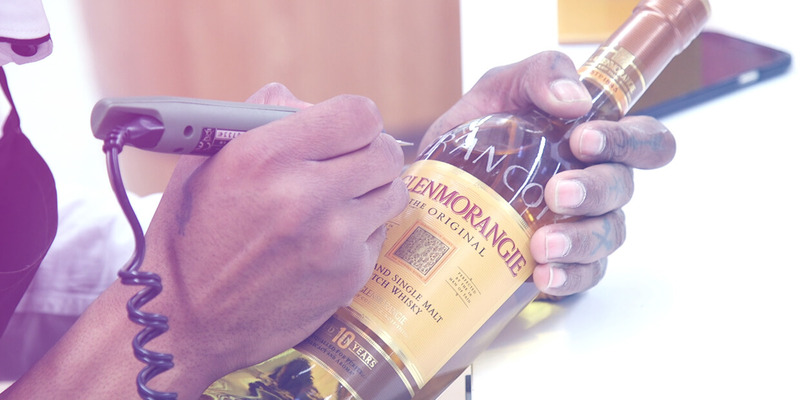 A digital component of the experience is offered via interactive kiosks that allow shoppers to journey through the Glenmorangie universe – an immersive educational approach to discover the history of the world-famous brand of single-malt scotch. 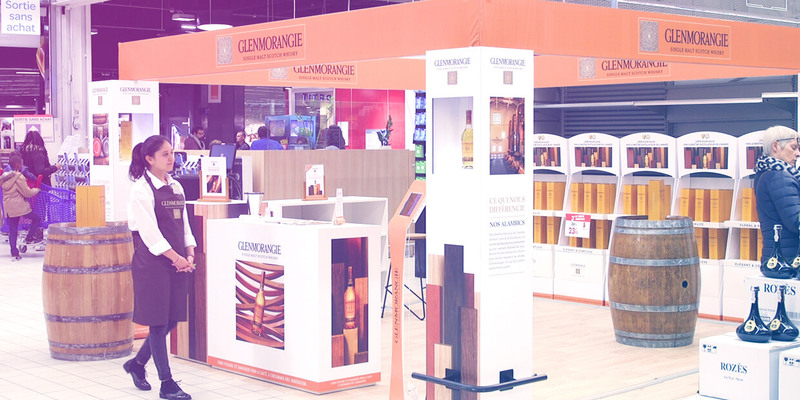 To deploy this shopper and retail activation strategy, Glenmorangie and Globe chose the Carrefour Podiums. Located at the heart of the flow of shoppers in the central or main aisle of 9 flagship Carrefour supermarkets located in the Paris region, these spaces true pop-up stores fully decked out in the colours of Glenmorangie brand, draw their inspiration from the visual universe – including the colours, materials, etc. – of Scottish distilleries, allowing shoppers to fully immerse themselves in the brand’s universe. Born out of a reflection process carried out by Carrefour and the Globe group, Carrefour Podiums offer a unique, premium in-store experience that combines a sell-in for the brand and a sell-out for the retailer. A sign of a firm stance and a strong commitment by Carrefour to support brands in its points of sale, the aim of Carrefour Podiums is to reinvigorate the shopper experience and boost sales. With dedicated shop-in-shop retail space of 28 m², these custom-tailored pop-up stores give brands 7 days to deploy phygital (physical + digital) experiences that allow the brand promise to come to life in accord with the brand’s platform. These premium retail spaces in 9 flagship Carrefours in the Paris region – hosting up to 650,000 shoppers every week – have already proven their effectiveness, boasting two-digit sales growth figures for shopper activations deployed since their creation. In the cities of Montesson, Carré Sénart, Chambourcy, Collégien, Drancy, Ivry sur Seine, Pontault-Combault, Saint Quentin, and Venette.